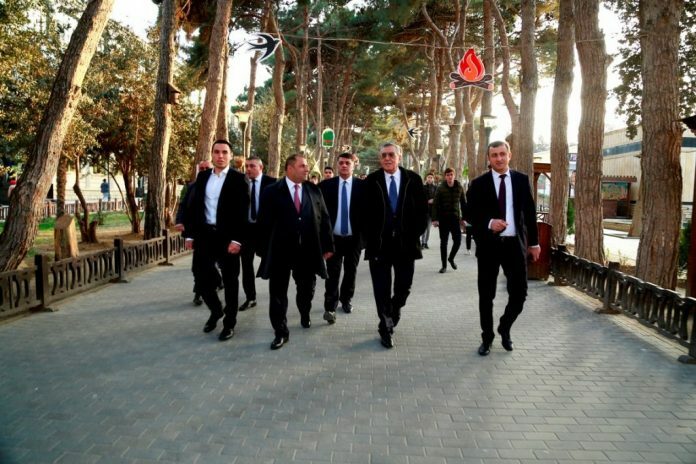 On March 15, representatives of the Azerbaijan sports management visited the AAAF Park Residential Complex, an ideal synthesis of ordinary life with sports. 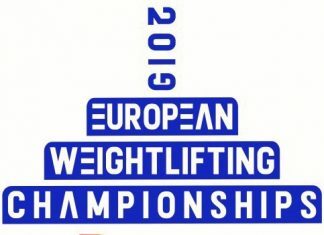 Vice-president of the Azerbaijan Weightlifting Federation and Azerbaijan Powerlifting Federation Azer Aliyev, Vice-president of the National Olympic Committee Chingiz Ismayilov, Head of Sports Department of the Ministry of Youth and Sports Farid Mansurov, President of the Azerbaijani Powerlifting Federation Aladdin Aliyev and Head of Baku City Youth Headquarters Ragif Abbasov toured the area by the accompany of Tofig Heydarov, the president of Zirve International Sports Club, and vice-president Ruslan Khanverdiyev. They were given comprehensive information about the Complex, gyms, lyceum and other educational institutions situated here. It was stated that AAAF Park Residential Complex, which is the central training-camp base of AZE WF and Zirve ISC, is the place that meets the most up-to-date standards, unique, modern, inimitable and where the ideal synthesis of ordinary life with healthy lifestyle is created. 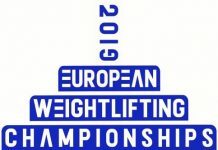 The Complex, formed for the enhancement of weightlifting, has all the opportunities to engage in this type of sport. The training-camp base situated in AAAF Park has two training and competition halls, fitness and Spa center, multifunctional swimming complex with the latest standards, cottages and hotels. 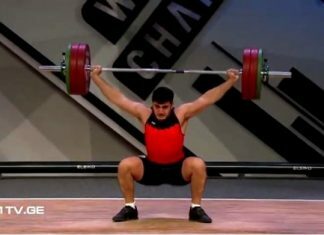 Along with the Azerbaijan weightlifting teams in all age groups, many other teams – Saudi Arabia, Egypt, Algeria, Morocco, Iraq and others regularly have used the services of an ideal space for preparing any international competitions. 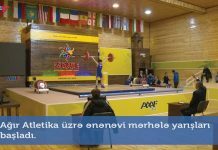 Here, the places with best conditions for holding the training-camps in various sport types, rhythmic gymnastics, judo halls, football and tennis courts as well as a great competition hall are operating. However, AAAF Park has lyceum and medical centers, various entertaining centers, restaurants and cafes, ice rink, 7D Cinema, Karting, brand stores. Then, the office building of AAAF Holding was reviewed. Tofig Heydarov informed the guests on the great AAAF Park projects. The model placed at the entrance of AAAF Park office in Astara has been welcomed with a special interest. It has been said that the new training-camp base built in Astara is a stupendous complex. 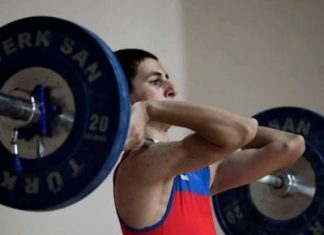 A 150-person competition and 20-person weightlifting training hall, dressing rooms provided with all conditions, as well as AAAF fitness hall equipped with modern facilities, canteen for 50 people and other rooms have been put into operation for the athletes in this multifunctional base. Additionally, a two-hectare Equestrian center, parking, an outdoor fitness area and a Cycling track belonged to “Zirve” ISC are available here. At different times, all age groups on Azerbaijan weightlifting have been in the training-camp here. At the groundbreaking and opening ceremonies of the AAAF Park Astara project, President of the Republic of Azerbaijan Mr. Ilham Aliyev attended as well. 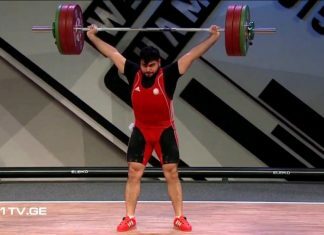 Esteemed guests were told that one of the biggest sport clubs in Azerbaijan, the planetary project – “Zirve” International Sport Clubs pay more attention not only to weightlifting but also to other Olympic and non-Olympic types. This will give an opportunity to watch this attention and work clearly in the forthcoming seventh Zirve Games on May.